The inaugural edition of the Abu Dhabi International Boat Show (Adibs), hosted and organised by Abu Dhabi National Exhibitions Company (Adnec), kicked off this morning in the UAE capital. Held under the patronage of Sheikh Nahyan Bin Zayed Al Nahyan, chairman of the Board of Trustees of Zayed bin Sultan Al Nahyan Charitable and Humanitarian Foundation and chairman of Abu Dhabi Sports Council, the show will run from October 17 to 20 at the Abu Dhabi National Exhibition Centre Marina, a venue dedicated to hosting international maritime events. This first-of-its-kind international boat show in Abu Dhabi to be held at the 31,000-sq-m purpose-built Adnec marina will see the participation of over 270 exhibiting companies from 25 countries, with as many as 90 boats berthed at the venue. The show will be featuring the participation of countries like the UK, Canada, Australia, Singapore, Italy. Japan, German, France, Spain and the US, which are bringing in leading companies such as Sea Ray, World Panel Products, Bay Liner, Mastercraft, Boston Whaler and Bertram--showcasing state-of-the-art products and services to a discerning audience comprising high net-worth individuals, marine industry experts, water sports enthusiasts, families and casual visitors. The show will feature a wide range of exciting activities, launches and entertainment shows to keep visitors entertained. 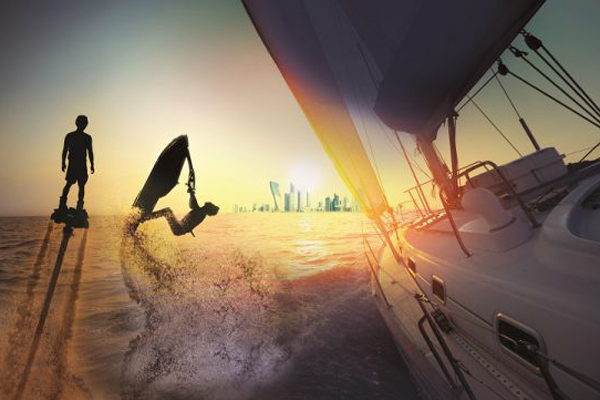 Some of these include the Open 60 sailing experience with Pindar, Kayaking and Water surfing with Watercooled, traditional Abra experience by Abu Dhabi Marine Sports Club, spectacular Flyboard shows, Seakart experiences by Seakart, Introduction to Boating by Marine Concept, in addition to orchestra performances and evening entertainments. There will also be a dedicated fishing zone with panel discussions and masterclasses on fishing equipment selection, safety in fishing, trolling, anchoring, casting and international fishing regulations and best practices.